I was gathering with a group of LGBTQ activists outside the Trump Hotel in Washington, DC for a dance party on a global-warming-kind-of-day in January 2018. The action was to thumb our noses at the horror that had taken over the White House the previous year and to make the statement that no one can take away our joy and our community spirit despite all of their vile and inhumane actions. Great tunes, great spirit, and some fully-charged speakers who encouraged us to dance like our lives depended on it—because they do. A few steps ahead of me, two younger women were standing side-by-side. The woman on the left had a pansexual pride flag tied around her neck and the woman on the right had a bisexual pride flag tied around hers. The way the two flags hung down their backs and the closeness of the two women produced a beautiful blending together of the flags; the pink of the pan and the pink of the bi overlapping. The image of the two of them was quite emotional for me and I snapped a few shots of them. I tweeted the photo and it struck a chord with many others as well and I’ve seen it pop up in all sorts of places unrelated to my own bi+ networks. Why would this juxtaposition of flags evoke such a strong response within me and within so many others? To me, all bi+ identifying people are linked. We all understand the power of loving outside the boundaries of the binary gay/straight sexuality that many others believe to be the only choices. I’ve been a bi+ organizer and activist for over 25 years and it’s been an important part of my activism that bi+ community should be a safe space for as many people as possible to participate within. 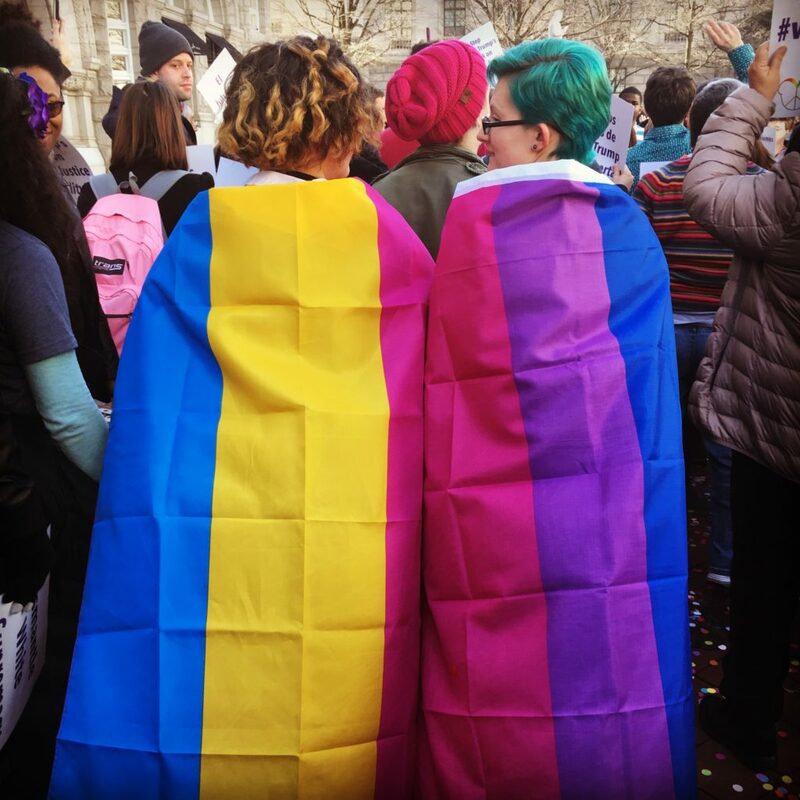 The Bisexual Resource Center (BRC) support groups (and most of the other groups I’ve ever heard of in the bi+ community) are not limited only to people who identify as bisexual; in fact, there are no identity requirements to participate. Along with bi+ folks, our support spaces have helped many gay and lesbian people come to terms with their own sexuality. Over the last ten years or so, there have been occasional tensions between folks who identify as bisexual and those who identify as pansexual. The tension, to me, feels unfortunate, misguided, and hung up on prefix derivation that no longer applies to deeper understandings within the community. 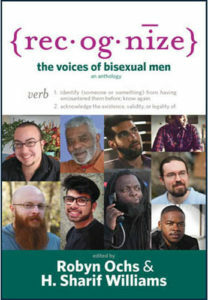 The Bisexual Manifesto, published in the bi national magazine, Anything That Moves, back in 1990, included this statement: “Do not assume that bisexuality is binary or duogamous in nature: that we have “two” sides or that we must be involved simultaneously with both genders to be fulfilled human beings. In fact, don’t assume that there are only two genders.” These understandings have been an integral part of bi+ community for decades and when others hold on to some archaic prefix definition in order to argue that bisexual and pansexual people are SOOOO different from one another it is a waste of energy and ignores our linked realities. At times, bisexual folks have felt attacked by pansexual people when a very narrow and binary definition of bisexual is used to discredit the identity and (directly or indirectly) say that bisexuals are transphobic. This last point is particularly painful to bi activists who worked alongside transgender activists in the 80s and 90s to add the B and the T to the movement acronym. It also ignores the high percentage of transgender folks who identify as bisexual and the high incidence of bisexual/transgender romantic partnerships. Several years ago, the BRC designed a word cloud t-shirt to help symbolize and celebrate the multiple identities that people in the bi+ community use for themselves – bisexual, pansexual, fluid, heteroflexible, AC/DC, omnisexual, queer, switch-hitter, ambisexual, bi-amorous, queer, no label and more. Even with all those terms, we still had people tell us that they used other terms to define themselves. Our community understands the complexity of sexuality and feels a strong need to express that complexity with these various identifiers. What’s great about the pansexual identifier is that it emphasizes that complexity, and other terms emphasize other aspects as well. There is no need to stifle the creative choices of people’s labels; however, as a bi+ organizer I also understand that there is a need to unify around shared terms and concepts. As organizers we use terms differently for different purposes. A personal identifier that you use within your closest circles can be different from a community identifier that will be used for political discussions or organizing purposes. I may use non-monosexual within the bi+ community to refer to all bi+ identities, but it is not a good primary term to use to self-identify. Describing yourself by what you are NOT is disempowering and reinstates monosexuals as the norm. 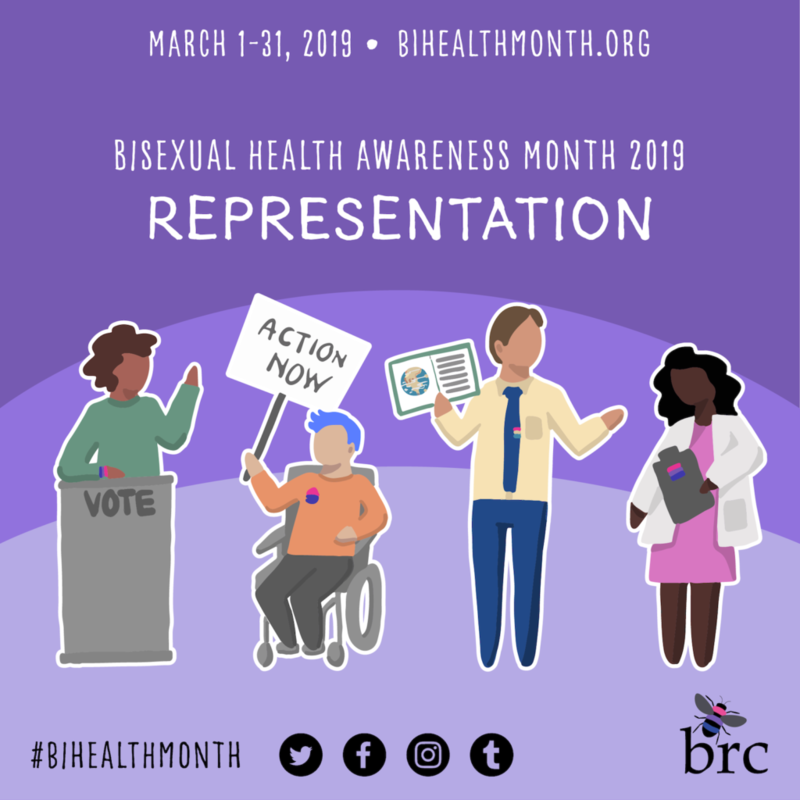 One of the things that Bisexual Health Awareness Month always brings to the fore is the harmful physical and mental health disparities that our community experiences. From what I know, whether you call yourself bisexual, pansexual, fluid, omnisexual or other terms, those disparities will affect your life in the same way. These are shared experiences of those of us who have a wider range of attraction than gay or straight people. Changing the label won’t make these disparities go away. What endangers our community is if we spend more time fighting over our personal identifiers and less time supporting each other and less time advocating for more resources and services for the entire bi+ community. Ellyn Ruthstrom is the Executive Director of SpeakOUT Boston, the oldest LGBTQ speakers bureau in the nation. She was the president of the Bisexual Resource Center for ten years.